Truckee, CA United States - D Smith 001 | Donner Lake Realty, Inc. The D. Smith unit is 3 bedroom, 2 bath, sleeps 7. This unit is a quintessential classic cabin with several updates, and direct lake access. Located directly across from Donner Lake on Donner Pass Road, this unit features panoramic views of the Lake and surrounding mountains from the main living area and decks. The parking pad is located on Donner Ave. There are 20 steps down from the parking area to the front door. Enter into the main level featuring raised wooden ceilings and exposed beams throughout the Living, Dining Area, Kitchen and Master Bedroom. The open concept Living, Dining Area and Kitchen all enjoy breathtaking Views of Donner Lake. The Dining Area provides access to the large back deck with a Gas BBQ, built-in benches and retractable awning. The Living Area features a rock wood burning fireplace, flat screen TV, and picture windows to highlight the Lake Views. The L-shaped Kitchen contains a 4 burner gas stove/oven combo, microwave, dishwasher, and is open to the main level to facilitate easy entertaining. 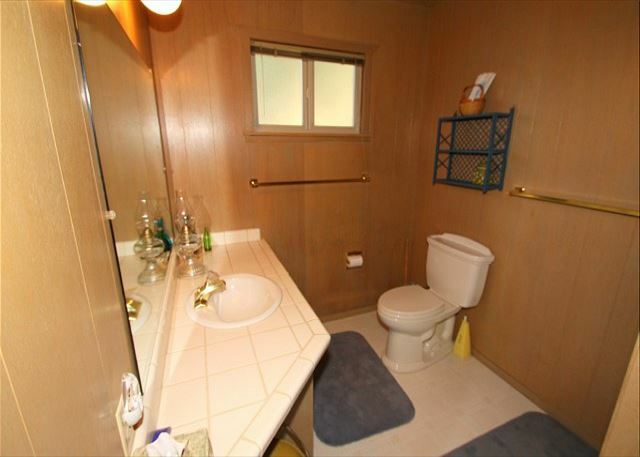 Also on the main level is a bathroom with a single sink vanity, toilet, and shower stall with a glass door. Across from the bathroom is the spacious Master Bedroom with a Cal-King sized bed, large closet and TV. Downstairs there are 2 additional bedrooms, a full bathroom, and a stack-able washer/dryer. Both downstairs bedrooms have access to Lake Views and the same private deck via sliding glass doors in each room. 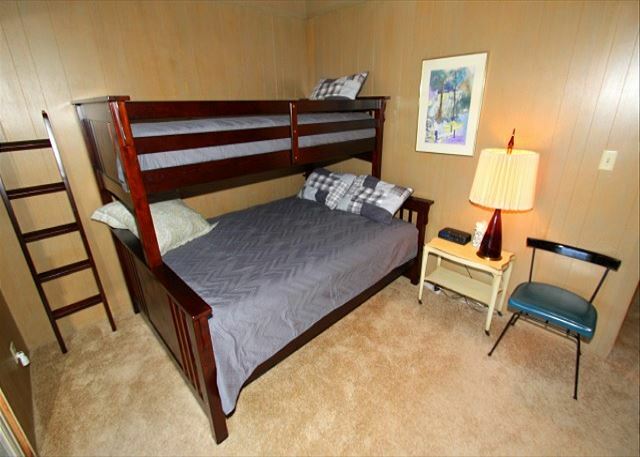 The kid's room features an extra long Twin over a Queen bunk bed and the other bedroom is spacious and has a Cal-King bed and private TV. This home rents with a 2 night minimum. Our units do not have sheets, pillow cases, or towels included in the rental, guests are requested to bring their own. However, we do offer linen rental service with 72 hrs notice before arrival: sheets, pillow cases, and towels at a onetime fee of $10 per person. Pets negotiable for an extra $150 one time fee. Please call for additional details.This unit offers a 10% discount to active or retired military members. **Nightly Minimum Subject to Change for Holidays** 4 night minimum for Thanksgiving, 7 night minimum for Christmas/New Year's, 3 night minimum for Martin Luther Holiday Weekend, 3 night minimum for Presidents Holiday Weekend, 3 night minimum over the 4th of July, 3 night minimum for Labor Day holiday Weekend. Discounted rate for stay of 7 nights or more!